The Swann Super HD 5MP Day/Night Surveillance Dome Camera delivers everything you need to expand your existing Swann 5MP DVR security system. By adding additional cameras, you can take advantage of the extra channels in the DVR and see more of what's happening at your premises. Its easy to get connected. The dome camera comes with a roll of 60 feet BNC cable. 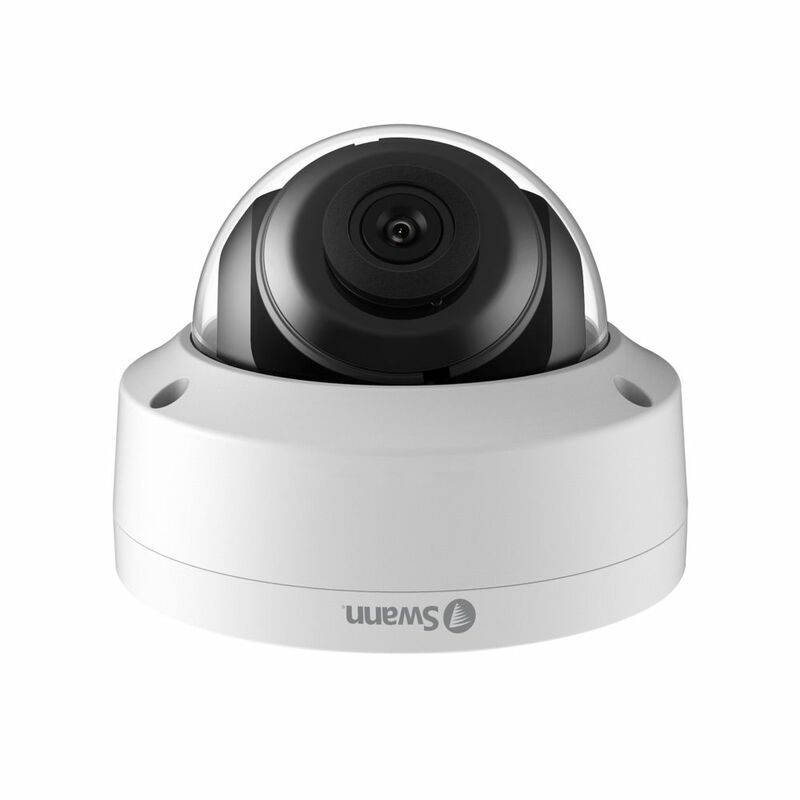 The dome style camera is IP66 rated for weatherproof use indoors or outdoors and can see further in the dark with infrared night vision up to 100 feet. You can mount the camera on a wall or ceiling with the mounting screws and plugs included in the pack. Once installed at your home or business you will be able to see front and back doorways, entrances, yards and more. Be amazed at the difference 5MP can make! Monitor your property from your phone, tablet or PC with the all-new Ring Spotlight Cam Wired, a motion-activated security camera with two-way audio, LED spotlights and a siren alarm. Ring Spotlight Cam Wired lets you create and customize your own motion zones, so you can focus on the most important areas of your home. When anyone steps on your property and triggers your motion sensors, you'll get an instant alert on your phone, tablet and PC. Answer the alert, and you can see, hear and speak to people on your property from anywhere. This Swann security camera is designed to be added on to your Swann SWNVK-490KH2 NVR. With 1080p full high definition resolution, you see important details in crystal clear clarity, such as faces, license plates, and clothing colours. The camera plugs into power while its video signal back to the NVR via Wi-Fi, making installation easy. With a built-in microphone and speaker, you can listen, talk back, and record audio to help you identify what's happening. Be protected day and night with the camera's powerful infrared night vision, up to 130 ft. (40m) and the ability to see colour video at night. Swann's True Detect(TM) heat and motion detection records and sends push notifications when it detects heat from warm objects, like people and cars. Cut the cost of crime and know what's happening by adding cameras to your NVR NVW-490 to cover any blind spots. This security camera features Swann's True Detect PIR Thermal-Sensing technology to reliably detect heat-generating moving objects, such as people, large pets & cars. With more accurate motion detection you have more reliable notifications & recording, eliminating false triggers such as falling leaves, bugs, rain & more, saving you hard drive space & playback time.The sturdy polycarbonate camera construction is weatherproof and can be used both outdoors and indoors plus, with the camera's powerful infrared night vision, see in the dark up to 100ft (30m). The camera comes with a roll of 60ft (18m) BNC cable to connect it to the DVR. 5MP TVI White Dome Security Camera The Swann Super HD 5MP Day/Night Surveillance Dome Camera delivers everything you need to expand your existing Swann 5MP DVR security system. By adding additional cameras, you can take advantage of the extra channels in the DVR and see more of what's happening at your premises. Its easy to get connected. The dome camera comes with a roll of 60 feet BNC cable. The dome style camera is IP66 rated for weatherproof use indoors or outdoors and can see further in the dark with infrared night vision up to 100 feet. You can mount the camera on a wall or ceiling with the mounting screws and plugs included in the pack. Once installed at your home or business you will be able to see front and back doorways, entrances, yards and more. Be amazed at the difference 5MP can make!